The second time we made the mistake of ordering a pizza off the menu. Yes, the restaurant is called TD Burger, but there are so many other items on the menu (think salads, sandwiches, pizzas, and chicken wings) that we had to sample something else. We feel that if you aren’t proud of an item, it shouldn’t be on the menu. Therefore, we decided to try a pizza. After asking for recommendations, we were steered towards the BBQ chicken pizza. The description said that it had “Moroccan BBQ, cumin seeds, and fried sage.” Maybe it had cumin seeds, but everything else was missing. The Moroccan BBQ chicken tasted like regular old BBQ sauce and the chicken did not have any special flavor (and was fairly dry). The crust was forgettable. Our mistake, skip the pizzas. On our third trip, we stuck with the burgers again and tried to keep it simple. The “Loree Blue” burger features blue cheese and bacon. 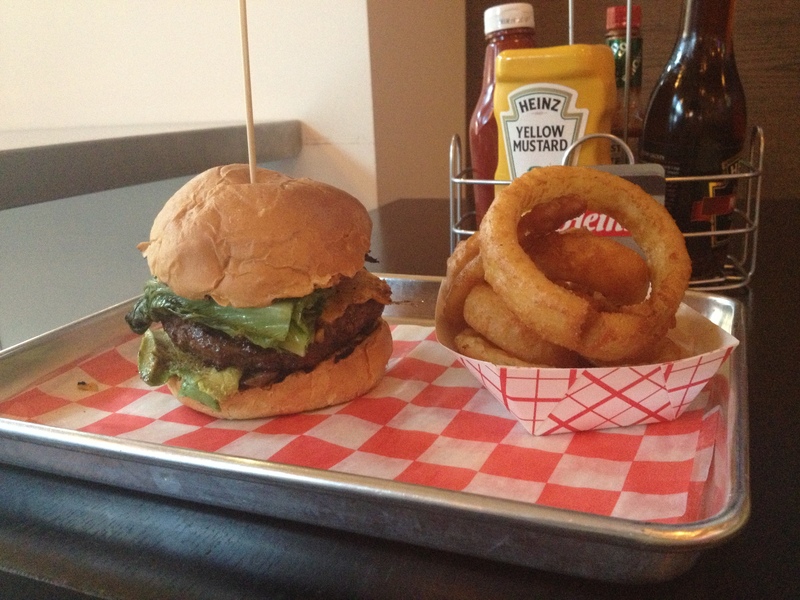 This time the burger was memorable–in a good way. The bun was not overly soggy and did not distract from the well seasoned and well grilled burger that had just the right amount of melted blue cheese and bacon. The fries were fairly standard, but tasted pretty good when paired with the burger. This time the service was quick and without any hiccups. It was the kind of experience that made us want to come back and try more on the menu in the future. TD Burger could be good with some improvements. The burger itself (the meat minus the bun) is quite good and has great flavor. Many of the toppings that go on the burger work well. The bun still needs improvement; it doesn’t need to be the best toasted bun in the world, it just needs not to distract from the rest of the burger. The pizzas should be axed from the menu. The restaurant’s name is TD Burger, not TD Pizza and Burger (we haven’t tried the salads or wings and can’t comment on them). If the pizza were great that would be one thing, but it is not and should not be on the menu. Finally, they need to figure out the alcohol service better. Either allow customers to order beer at the main counter or have enough attentive alcohol servers in the restaurant and on the patio so that customers do not have to wait significant periods of time simply to get a beer. We hope the restaurant will continue to improve as it would be a very welcome addition to the NoMa neighborhood. I had the same experience, bad service, soggy buns. This place needs to close! I’m waiting for a delicious place to replace it and put the big patio to good use!